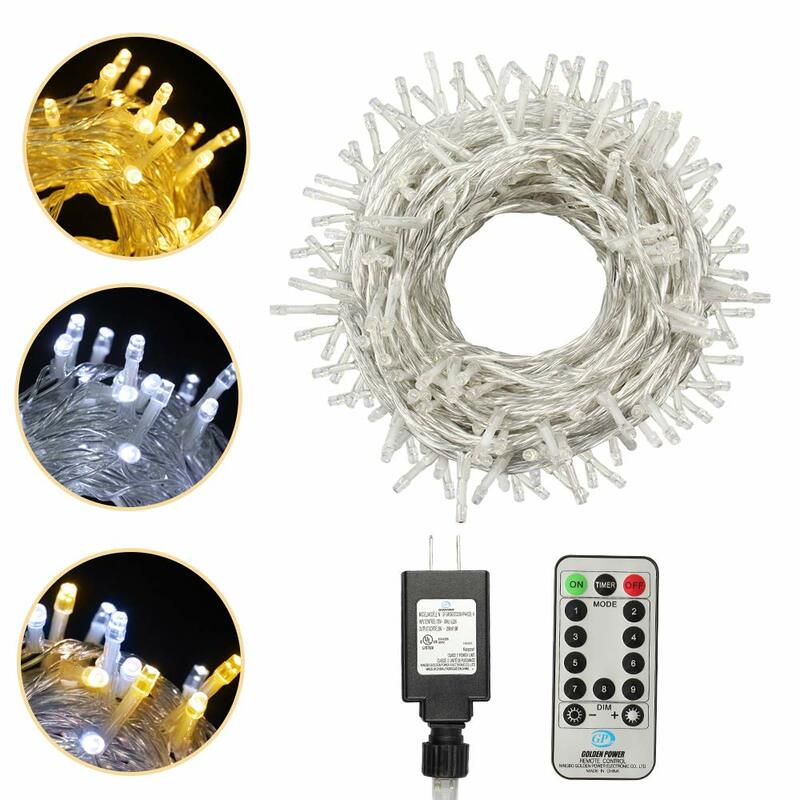 【UPGRADE 3 COLAR MODES DESIGN】 Compare with other only single color christmas string lights on amazon. Our new design string lights come with three color modes: you can set Warm White, White, the Combination Color of Warm White and White. Buy one and you’ ll get three different colors of lighting effects to cope with different usage scenarios. 【LONG LENTH & END TO END EXPANDABLE】 Longer wire + more LEDs. This super long 82ft fairy string lights with 200 individual LED bulbs. And each Christmas light has end-to-end connection that allows up to 3 strands connected together to illuminate a wider range. They will brighten up the dark corner for happiness atmosphere inside or outside. 【4 LEVELS DIMMABLE & 9 LIGHTING MODES】 Easy to control the lights with a smart remote. 4 levels brightness and adjustable 9 lighting modes provide the perfect solution for your decorative lighting needs. You can set brightness to 100%, 75%, 50%, 25%. Comes With 9 Lighting Modes For Choosing: Combination, White Steady On, Warm White Steady On, White Slo-glo, Warm White Slo-glo, 2 Colors Sequential, 2 Colors Twinkle/flash, 2 Colors Slow Fade, 2 Colors Slo-glo. 【DURABLE AND WEATHER RESISTANT】The fairy string lights is waterproof and designed to withstand light rain or water spills, it can do great job at bad outdoor environment, ideal for both outdoor and indoor decoration. The strong construction makes it tough and sturdy, this led christmas lights is durable enough to last many years of use. 【HIGH SAFETY UL CERTIFIED PLUG】High-safety plug is guaranteed with UL certification. And string lights are completely safe to touch without risk of burns. You can fully enjoy the lights without worrying about being hurt. All of our led string lights come with 60-day money back and 12-Month free replacement warranty. If for any reason you are not completely satisfied with your purchase please feel free to contact us to solve it. Take it risk free.